Pininfarina says it has tried to design the SUV to be “muscular and robust in appearance, with design elements adding to the strong SUV impression, yet still retaining a lithe, sporty look.” It certainly has an unmistakable and strong front clip. The VinFast 2.0 LUX sedan tries to convey a powerful, dynamic stance with a mixture of curved and concave surfaces that aim to create a sense of elegance and prestige. The first two prototype cars designed by Pininfarina for VinFast, a new Vietnamese car company, were given their world premieres yesterday on the occasion of the opening of the Paris Motor Show. The two models are dubbed the LUX A2.0 (sedan) and LUX SA2.0 (SUV). Pininfarina’s partnership with VinFast however goes further than the design development of two models. As a brand-new car company developing its first own range of vehicles, Pininfarina has created a recognisable brand identity and developed a specific design language that will be found in all VinFast models in the future, such as the unique V logo in the grille, which references the country of Vietnam, as well as the Vingroup and VinFast brands. Pininfarina has then developed the exterior and interior design of the new LUX A2.0 sedan and LUX SA2.0 SUV and built in Cambiano the two showcars that VinFast yesterday unveiled in Paris. Pininfarina has also designed VinFast booth at the Paris Motor Show and it will guide the company during the go-to-market phase by designing the new VinFast dealerships. 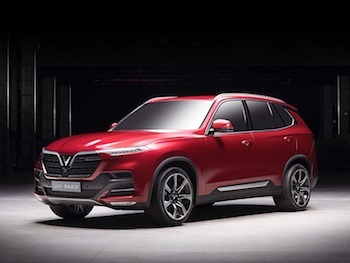 Vinfast is part of Vingroup, one of the largest companies in Vietnam, which hopes to initially produce between 100,000 and 200,000 Vinfast-branded vehicles per year, including five-seat sedans, seven-seat SUVs, and electric motorbikes. Vinfast has taken several steps intended to prove it can aim for a big chunk of the Vietnamese car market, including the appointment of James B. DeLuca, a former executive vice president of General Motors, as its general manager. DeLuca will take charge of the construction, operation, and development of the SUVs and sedans. The connection with Pininfarina goes back to a design competition the company held. In order to find a style that reflected the desires of the Vietnamese driver, VinFast did something no car brand has ever done before. First, it commissioned design sketches for a sedan and a SUV from four of the world’s best-known car design studios. Then in October 2017, it put all 20 designs on its website and asked Vietnamese consumers to vote on which models they liked the most. However forward-looking designs rarely comes from involving the public or focus groups and this clearly shows in the showcars which are clean and tidy in Pininfarina’s usual style but are also very much generic sedan and SUV designs. Since that contest where Pininfarina got the nod, VinFast has worked hard with Pininfarina to further develop the cars and deliver the winning designs – designs which aim to be Vietnamese in character and style. One specific highlight of the debutant’s design language is prominent at the front of both its new cars – the chrome ‘V’ emblem at the centre of the grille. To the right is a horizontal chrome element that combines with the LED daytime running lights to create an italicised F-motif, representing the second syllable of VinFast, and an asymmetric flourish. From the central ‘V’ emblem carries on through the crease lines that run over the bonnet. 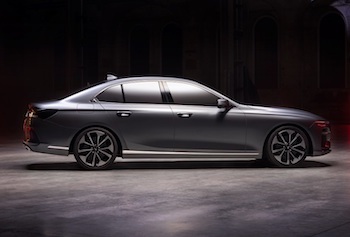 The sedan tries to convey a powerful, dynamic stance with a mixture of curved and concave surfaces that aim to create a sense of elegance and prestige. The long bonnet visually extends the front of the car, with the sleek headlights drawing the eye to the corners, while the roofline stretches rearward to create a cab rearward effect. The C-pillar is elongated to visually continue the roofline rearwards, with the rear glass raked at an angle. The chrome elements aim to convey a premium feel. A lower chrome line runs along the length of the body side through to the rear to accentuate the proportions. Higher up the bodyside is a sharp, flowing line that aims to create a sense of forward momentum. The splitter at the lower edge of the front bumper improves aerodynamic performance through wind tunnel testing – as air is forced into the intake and expelled ahead of the wheel arches to reduce drag-inducing turbulence around the wheels. At the front, the LUX SA2.0’s bumper guard was developed to be sculptural and to incorporate cleanly the headlight layout, air intakes and fog lights. The lighting elements try to add up to create an SUV style, vertically stacked from the low-positioned fog lights up to the headlights half-way up, capped by the daytime running lights that flow out from the VinFast logo. It all adds up to a somewhat awkwardly styled lower front clip and notably the fog lights are mounted so low they will be exposed to the possibility of receiving damage, especially due to the poorer road surfaces in Vietnam. “The new SUV’s aesthetic appeal is strengthened with sculptural, flowing lines that create a sense of forward-leaning aspect, giving the car a sense of dynamic power,” claims Pininfarina’s statement. The lower side chromed rubbing strip is inserted into the protective backing trims in opposition to its styling which certainly looks awkward in the photos released by Pininfarina but may work better in the flesh. Pininfarina reckons that it used Vietnamese culture as a starting point for the interior design. “The inspiration for VinFast’s interiors was Vietnam itself,” the company says. “The design team understood that finding a way to express the Vietnamese personality and broader cultural traits was vital, so they could build a car that would emotionally fulfil the desires and aspirations of Vietnam’s motorists. The lines aim to remain clean and simple and the control surfaces feature very few buttons. For VinFast, creating a clean, cutting-edge user interface was essential. Technology is vital – Vietnam is a smartphone country: more than 80 per cent of the population use smartphones, a higher proportion of the population than in other countries including the USA so the large 10.4-inch touchscreen dominating the centre console aims to present a familiar and welcoming interface. The large configurable touchscreen is the control hub of the car and features simple navigation and menus. The design team tasked themselves with creating a fresh new look for the interface, the goal was to simplify features whenever possible and make the feeling of the interface as distinctly Vietnamese as possible. VinFast has created a system to incorporate a more human element for VinFast cars. It uses fewer buttons, prioritising the hierarchy of functions and uses a colour palette that is easy to read. The result is a UX design. The homepage, for example, has just three icons for top level access, plus a display showing the climate control status in the car. This home menu is contextual with only three large buttons for phone connectivity navigation and audio. The sub-level menus below this — including for the phone and the audio and even the navigation system — owe far more to contemporary smartphone design in terms of both aesthetic and function than perhaps anything yet seen in automotive UX de-sign. Users swipe down for shortcuts in the same way that you would using an Android or Apple phone. As a point of interaction between occupant and car, the touchscreen has a colour palette to reflect the dramatic use of colour in the Vietnamese culture and nature. There are three different themes each based on a Vietnamese landscape, offering the driver a choice of mood and colour. Customers can upload their own photos and choose from Vietnam-themed wallpapers for use as a background to the interface, landscapes familiar to Vietnamese customers, including terraced rice fields and H? Long Bay. This element of personalisation is part of an overall aesthetic designed to connect with local consumers. In addition to the centre console touchscreen, a prominent seven-inch colour driver information display is set in the centre of the instrument binnacle, flanked by an analogue dial on each side. The layered form of the instrument panel – as with other elements of the interior styling lines – was inspired by the Vietnamese countryside. The subtle presence of technology in the cabin is complemented by ambient lighting strips integrated into the horizontal interior trim lines across the dash and doors. Designers spent significant time getting the proportions right, with optimised ergonomics and clear lines of sight dictating much of the interior layout.